Our aim was to develop guidance for general paediatricians and primary care physicians in diagnosing and managing cow’s milk protein allergy in infants. The guidelines were developed by discussion based on existing national recommendations and standards, clinical experience and, whenever possible, evidence from the literature. Separate algorithms cover breast-fed and formula-fed infants. The recommendations emphasise the importance of comprehensive history taking and careful physical examination. Patients with severe symptoms need to be referred to a specialist. Elimination of cow’s milk protein from the infant’s or mother’s diet and challenges are the gold standard for diagnosis. This guidance is intended as a basis for local discussion, implementation and prospective evaluation. The algorithms should be regularly assessed using clinical audit standards. Once validated, the diagnostic framework could provide a standardised approach in epidemiological and therapeutic studies. CMPA persists in only a minority of children. The prognosis (ie, the likelihood of becoming tolerant to CMP) depends on the patient’s age and titre of specific IgE at the time of diagnosis.9 In the experience of the taskforce members, children with proven CMPA who are radioallergosorbent test (RAST) or SPT negative become tolerant to CMP much earlier than atopic children with positive test results. Furthermore, patients with a history of IgE-positive CMPA are at increased risk of developing atopic diseases, such as asthma, atopic dermatitis and rhinoconjunctivitis, than those who were IgE-negative. Children with negative tests are less likely to develop multiple food allergy.10 Therefore, it is preferable to test for specific IgE (if not performed during the diagnostic work-up) in children with CMPA proven on challenge. There are guidelines for the use of dietary products for the prevention and treatment of CMPA.11 12 However, there are currently no guidelines that specifically assist primary care physicians and general paediatricians in the accurate diagnosis and management of CMPA. This document aims to meet this need. However, these recommendations may need adaptation to reflect local situations and, because they are not evidence based, need to be prospectively validated and revised in the future. Despite these caveats, the authors believe application of these recommendations will improve the diagnostic and therapeutic skills of physicians in primary care. The corresponding author recruited a task force to develop an algorithm for the diagnosis and treatment of CMPA. SHS/Nutricia donated a grant to enable the authors to meet and discuss the development of the algorithms. The recommendations developed were based on existing national recommendations and standards, present in Germany,13 the Netherlands14 and Finland,15 and personal experience of the authors. The manuscript is based on a consensus that was reached following a review of the literature and whenever possible evidence-based data were used to strengthen the proposals. Separate algorithms were developed for breast-fed and formula-fed infants. 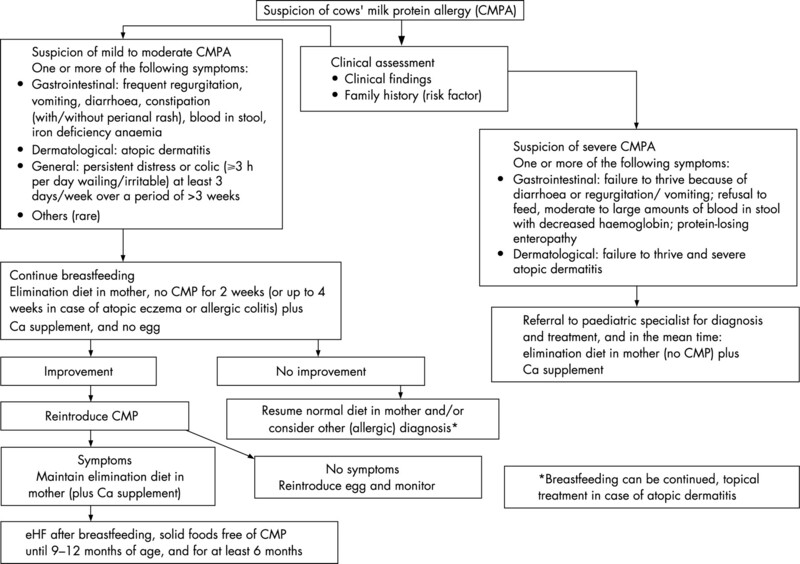 Figure 1 Algorithm for the diagnosis and management of cow’s milk protein allergy (CMPA) in exclusively breast-fed infants. eHF, extensively hydrolysed formula. 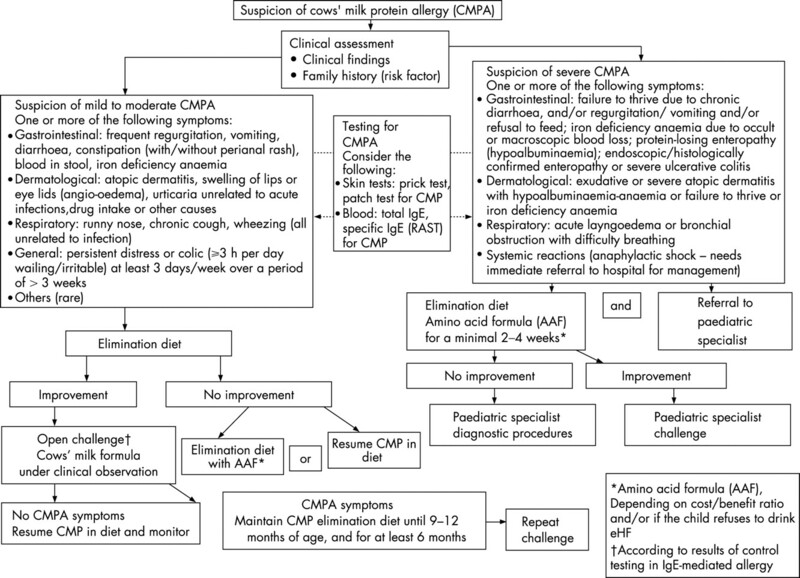 Figure 2 Algorithm for the diagnosis and management of cow’s milk protein allergy (CMPA) in formula-fed infants. Unfortunately, there is not one symptom that is pathognomonic for CMPA. The most frequent symptoms of CMPA are listed in table 2. The timing and pattern of these symptoms aid the differential diagnosis. Symptoms of CMPA occur often, but not always, within the first weeks after the introduction of CMP. Many children with CMPA develop symptoms in at least two of the following organ systems: gastrointestinal (50–60%), skin (50–60%) and respiratory tract (20–30%).1 The symptoms associated with CMPA can range from mild to moderate to severe, although this stratification is by its nature subjective. In this guidance, symptoms that put the child at an immediate life-threatening risk (such as anaphylaxis or laryngeal oedema) or may interfere with the child’s normal development (such as “failure to thrive” or “growth faltering”) differentiate severe from mild-to-moderate CMPA. Reactions to other foods, especially egg and soy, but also wheat, fish, peanut and other foods depending on the regional dietary intake, may occur in combination with CMPA.24 Therefore, complementary feeding and, preferentially, all supplementary feeding should be avoided during the diagnostic elimination diet. Breast feeding is the gold standard for milk feeding in infant nutrition and is recommended exclusively for the first 4 months of life at least.25 The incidence of CMPA is lower in exclusively breast-fed infants compared to formula-fed or mixed-fed infants. Indeed, only about 0.5% of exclusively breast-fed infants show reproducible clinical reactions to CMP and most of these are mild to moderate. This might be related to the fact that the level of CMP present in breast milk is 100 000 times lower than that in cow’s milk.26 In addition, immunomodulators present in breast milk and differences in the gut flora in breast-fed and formula-fed infants may contribute to the prevalence of CMPA in breast-fed compared to formula-fed infants. The most frequent symptoms of CMPA in exclusively breast-fed babies are listed in table 2 and include general dermatological and gastrointestinal manifestations. Severe forms of CMPA (table 1) are very rare in exclusively breast-fed infants. The occasional cases that occur are usually severe atopic dermatitis with protein losses and failure to thrive. Other rare conditions suggesting severe CMPA include anaemia due to colitis with rectal bleeding and protein-losing enteropathy. In these cases, introducing CMP into the infant’s diet (eg, supplementary feeding) may exacerbate the symptoms. Cases with alarm symptoms should be referred to a paediatric specialist for further diagnostic work-up and management. In these infants, diagnoses other than CMPA are much more likely, and identifying the correct diagnosis should not be delayed. Breast feeding should be promoted for the primary prevention of allergy, but breast-fed infants with proven CMPA should be treated by allergen avoidance.18 There is evidence that food proteins from milk, egg, peanut and wheat are excreted in breast milk and may cause adverse reactions during exclusive breast feeding in sensitised infants. Due to the many benefits of breast feeding to the infant and the mother, clinicians should advise mothers to continue breast feeding but avoid the causal foods in their own diet. Egg avoidance studies indicate the foetus may be exposed to maternally-derived egg antigens despite maternal dietary avoidance measures.27 In infants with atopic dermatitis, the risk of being sensitised to milk was four times higher, and to egg eight times higher, than in infants without atopic dermatitis.28 Age at first introduction of solid food and diversity of solid food showed no effect on atopic dermatitis incidence.28 However, there are no data on additional systematic elimination of hen’s egg in symptomatic infants. Therefore, as fig 1 shows, if the infant develops symptoms of allergy, a maternal exclusion diet avoiding food containing CMP and hen’s eggs is advised by the task force although the evidence for CMP is more exhaustive than for hen’s egg. In a subgroup of children with severe atopic dermatitis, peanut could as well be eliminated from the mother’s diet since peanut allergy is more likely in children with atopic dermatitis. When deciding which foods with a high allergenic potential to suggest avoiding (hen’s eggs rather than, for example, wheat and fish), the taskforce considered evidence that in most geographical regions egg proteins are the most common cause of allergy after CMPA in infants and young children. The evidence that peanut allergy can cause severe symptoms has been well established, but not in exclusively breast-fed infants. In contrast to milk and egg, peanut consumption is common in only parts of the world such as the USA, UK and some other European countries. In primary prevention, which is not the topic of this manuscript, it has been shown that peanut is secreted into breast milk following maternal ingestion.29 Since peanuts are not an essential nutritional part of a normal diversified diet, they are easy to avoid, and since infant sensitisation through breast feeding has been suggested, the task force suggests eliminating peanut as well from the mother’s diet (although the evidence for peanut is much weaker than for cow’s milk and egg). The task force recognised the difficulties in implementing such widespread dietary recommendations. Further studies are required to test the feasibility of such programmes and whether they are effective if implemented on a large scale. Furthermore, a diet that also excludes fish, wheat and other gluten-containing grain products is very demanding for the mother and may increase the mother’s risk of consuming an unbalanced diet. Therefore, the relative risk associated with an extensive, first-line exclusion diet may be greater than the potential benefit. In a secondary approach, the additional elimination of wheat and fish will require the advice of an experienced dietician in order to ensure that an adequate nutritional intake is maintained. If the mother has a certain suspicion that another food elicits the symptoms in her child, the elimination diet should be adapted accordingly. In some very rare cases, such as in infants with severe atopic dermatitis with impaired growth, breast feeding should be stopped.18 However, the authors strongly propose that these infants should be referred to a specialist before breast feeding is discontinued. The elimination diet should be continued for a minimum of at least 2 weeks, and up to 4 weeks in cases of atopic dermatitis or allergic colitis. The mother will require calcium supplements (1000 mg per day divided into several doses) during the elimination diet. If the elimination diet fails to improve the symptoms, the mother should resume her normal diet and a referral to a specialist should be considered, depending on the type and severity of the infant’s symptoms. If symptoms improve substantially or disappear during the elimination diet, one food per week can be reintroduced to the mother’s diet. If symptoms do not re-appear on reintroduction of a particular food to the mother’s diet, the elimination of that specific food can be discontinued. If symptoms re-appear, the food responsible should be eliminated from the mother’s diet as long as she is breast feeding. If solid foods are introduced into the infant’s diet, care should be taken to ensure solids are free from the food proteins that the infant is allergic to. If CMP is the responsible allergen, the mother should continue to receive calcium supplementation during the elimination diet. If the mother is on a CMP-elimination diet for a long period, appropriate nutritional counselling is required. When the mother wants to wean her infant, the child should receive an extensively hydrolysed formula (eHF) with demonstrated clinical efficacy. Patients with life-threatening, particularly respiratory symptoms or anaphylaxis, conditions need to be referred immediately to an emergency department experienced in the treatment of this condition. In all the other situations, the initial step in the diagnostic work-up for CMPA is clinical assessment accompanied by history taking, including establishing whether there is a family history of atopic disease (fig 2). In a case of suspected mild-to-moderate CMPA, CMP elimination should start with a therapeutic formula for CMPA. The guidelines define a therapeutic formula as one that is tolerated by at least 90% (with 95% confidence) of CMPA infants.31 These criteria are met by some eHFs based on whey, casein or another protein source, and by amino acid-based formulae (AAF). Preferentially, all supplementary food should be stopped during the diagnostic elimination diet. If this is not possible in infants beyond 6 months, only a few supplementary foods should be allowed with dietary counselling. Nevertheless, the diet should not contain CMP or hen’s eggs, soy protein or peanut. Referral to a paediatric specialist and dietary counselling may be needed for patients who do not improve. In such cases, further elimination of other allergenic proteins such as fish and wheat may be appropriate. In most cases, the therapeutic elimination diet should be given for at least 2 weeks, although this may need to be increased to up to 4 weeks in gastrointestinal manifestations and atopic dermatitis before deciding that the intervention has failed. eHFs that meet the definition of a therapeutic formula are the first choice. An AAF is indicated: if the child refuses to drink the eHF, but accepts the AAF (eHF has a more bitter taste than AAF), if the symptoms do not improve on the eHF after 2–4 weeks, or if the cost–benefit ratio favours the AAF over the eHF. The cost–benefit ratio of AAF versus eHF is difficult to elaborate in this global overview since health care cost differs substantially from country to country, as does the cost of the eHF and the AAF, which in some countries is (partially) reimbursed by national or private health insurance. The risk of failure of eHF is up to 10% of children with CMPA.4 In the latter case, clinicians should refer to a specialist for further diagnostic work-up. Children may react to residual allergens in eHF, which may be one reason for the failure. The residual allergens in eHFs seem to be more likely to produce gastrointestinal and other non-IgE-associated manifestations compared to AAFs.4 6 32 However, IgE-related reactions have also been reported with eHF.6 In such cases, clinicians should consider an AAF which has been proven to be safe and nutritionally adequate to promote weight gain and growth.4 6 In some situations, the infant may be initially switched to an AAF, especially if they experience multiple food allergies, specific gastrointestinal manifestations or both. In these instances, the potential benefits of an AAF may outweigh its higher cost. If symptoms do not disappear on the AAF, another diagnosis should be considered. The results of these tests may guide optimal management: SPTs and RAST are especially helpful in predicting the prognosis and the time interval until the next challenge. Infants with negative RAST and/or SPT at time of diagnosis become tolerant to the offending protein at a much younger age than those with positive reactions. In addition, a negative SPT and RAST result reduces the risk of a severe acute reaction during challenge. On the other hand, infants presenting with early-onset symptoms such as angio-oedema or swelling of the lips and/or eyelids, urticaria and immediate vomiting are likely to have IgE-mediated allergy. If these infants have a SPT with a reaction with a large diameter (>7 mm) or very high titres in the RAST test, the likelihood is over 90% that the child will have a positive food challenge.30 In these highly atopic infants, the confirmatory CMP challenge can be postponed until the child shows a reduced reaction in the tests for CMP-specific IgE. However, an open challenge under medical supervision can be performed after taking a complete history in infants with mild-to-moderate reactions without any prior blood sampling or SPTs. Patch testing in the investigation of CMPA is still a subject of on-going research and can aid the diagnosis of non-IgE-associated reactions. Patch tests may contribute to the diagnosis of food allergy, even when SPT and RAST were negative.34 However, the patch test method needs to be standardised. If the symptoms substantially improve or disappear after 2–4 weeks on an elimination diet, an open challenge with a formula based on whole CMP should be performed. While the challenge needs to be performed under medical supervision, the test can be done, in most cases, in non-hospital settings.35 Primary care physicians should be aware that the severity of a past reaction might not predict the severity of a challenge reaction, particularly after a period of dietary exclusion.36 37 Previous mild reactions may be followed by anaphylactic reactions in some infants with CMPA. For this reason, open challenges should preferentially be performed in a setting where safety facilities (eg, resuscitation) are available. Mild-to-moderate reactions clearly exclude infants with severe reactions in their medical history, such as systemic anaphylactic symptoms, respiratory symptoms with breathing problems, and severe enteropathy with failure to thrive. In these cases of severe manifestations, the challenge should be performed according to the protocol of the hospital, with or without an intravenous line, in a setting that offers experience of immediate adequate treatment. Infants with severe manifestations can be followed with SPT or specific IgE measurements, and if these are supportive of the diagnosis, a strict exclusion diet should be maintained until a resolution or improvement of the allergy tests occurs. In a case of previous anaphylaxis, a challenge is contraindicated unless SPTs and/or specific IgE measurement show improvement. In these cases, the challenge should always be performed in a hospital setting. During oral provocation the dose of formula should be titrated as follows. After a physical examination of the undressed infant, with inspection of the skin, a drop of the formula is put on the lips. If no reaction occurs after 15 min, the formula is given orally and the dose is increased stepwise (0.5, 1.0, 3.0, 10, 30, 50 to 100 ml) every 30 min. Thereafter, the infant is observed for 2 h and examined for cutaneous and respiratory reactions before going home. If no reaction occurs, the child should receive at least 250 ml of cow’s milk-based formula each day for the next week and the parents told to observe the child for late reactions. If symptoms of CMPA re-appear, the suspected diagnosis of CMPA is confirmed and the infant should be maintained on an elimination diet using eHF or AAF until the child is between 9 and 12 months of age, but for at least 6 months, whichever occurs first. The challenge is then repeated. If it is possible to follow the infant with IgE-mediated allergy with SPTs and/or specific IgE determination, normalisation or improvement of these tests would help in choosing the time point of challenge. Supplementary feeding should be introduced carefully to avoid accidental intake of CMP. Nutritional counselling must ensure a sufficient intake of the therapeutic formula (eHF or AAF) to guarantee adequate calcium intake. Formula-fed infants suspected of suffering from severe CMPA should be referred to a paediatric specialist. In the meantime, an elimination diet should be started and the child should preferably receive an AAF. AAF is recommended because infants in this group fail to thrive, suffer from macronutrient deficiencies or have pain. In these cases, AAF minimises the risk of failure on an eHF and further weight loss. Many of these children may need further diagnostic work-up to rule out other diagnoses. However, the recommendation to use AAF as a first choice is based on clinical experience, not on evidence. This approach should be prospectively validated. The decision concerning allergen challenge in cases with severe CMPA should always be made by a specialist and performed in a hospital setting. In cases with a history of a life-threatening reaction, a food challenge may be contraindicated. These recommendations have been developed as guidance for general paediatricians and primary care physicians to assist with the diagnosis and management of CMPA in breast-fed and formula-fed infants. They emphasise the importance of breast feeding, which is the preferred method of feeding healthy infants. The recommendations also underscore the importance of a comprehensive history taking (including a family history of atopy) and a careful physical examination to exclude other causes, identify any concurrent conditions and classify the condition as mild-to-moderate or severe CMPA. The algorithms differ according to the method of feeding (breast-fed or formula-fed infants) and according to the severity of symptoms. Blood-stained stool in an infant is alarming for the mother, although recent evidence suggests this is a benign and self-limiting phenomenon, mostly occurring in exclusively breast-fed infants. CMA in these patients is less common than previously believed, and an association with viruses can be observed in some patients. CM challenge is thus essential in infants who become symptom-free during a CMP-free diet to reduce the number of false-positive diagnoses of CMPA.38 In cases with recurrence of symptoms after reintroduction of dairy products in the mother’s diet, the algorithm recommends eHF if the mother wants to start weaning the infant and if the child is younger than 9–12 months. However, one could speculate that since the infant reacted to the (very) small amounts of proteins present in its mother’s milk, it might be preferable to recommend AAF. Unfortunately, no data are available on this topic. Patients with severe symptoms need to be referred to a specialist experienced in managing childhood allergies. In formula-fed infants, clinicians should consider whether SPTs, patch tests and determination of specific IgE would aid the diagnostic work-up and guide management. However, elimination diets and challenges are the gold standard for diagnosing CMPA in formula-fed infants.35 For simplicity and for socio-economic reasons, an open challenge is recommended by the taskforce. In the case of a doubtful outcome, a double-blind placebo-control challenge is helpful. If a reduction in the cost of diagnostic testing is important, RAST, SPT or both can be limited to those infants responding to an elimination diet to guide the challenge or after a positive challenge to predict the prognosis more accurately. Infants with mild-to-moderate symptoms should receive eHFs, or AAF if the infant refuses to drink eHF or if the cost–benefit ratio favours AAF, for at least 2–4 weeks. Children who show a substantial improvement or disappearance of symptoms should undergo a challenge under medical supervision. If symptoms of CMPA emerge upon food challenge, the child should be maintained on eHF or AAF for at least 6 months or until 9–12 months of age. If symptoms do not improve on eHF, primary care physicians and general paediatricians should consider an elimination diet with AAF, other differential diagnoses or both for the symptoms and/or refer the patient to a paediatric specialist. These recommendations are intended as a basis for local discussion, implementation and prospective evaluation. National or regional organisations should ensure that education is provided for families regarding a milk avoidance diet. Health care providers should be instructed about rescue medications such as antihistamine use and adrenaline in case of accidental exposure to the offending antigen(s), especially in infants with IgE-mediated allergy. The algorithms are based as much as possible on existing evidence, but should be assessed using clinical audit standards, such as the number of children with symptoms, growth and developmental milestones, and percentiles for height and weight. Any local versions of this guidance should be regularly re-audited to ensure that best practice is followed. Once validated, we hope the diagnostic framework could provide a standardised approach in prospective epidemiological and therapeutic studies.
. Frequency of cow’s milk allergy in childhood. Ann Allergy Immunol 2002;89(Suppl 1):33–7.
. Manifestations of milk allergy in infancy: clinical and immunologic findings. J Pediatr 1986;109:270–6.
. The diagnosis and management of cow milk protein intolerance in the primary care setting. Pediatr Nurs 2005;31:486–93.
. Allergy to extensively hydrolysed cows’ milk proteins in infants: safety and duration of amino acid-based formula. J Pediatr 2002;141:271–3.
. Cows’ milk allergy versus cow milk intolerance. Ann Allergy Asthma Immunol 2002;89(Suppl 1):56–60.
. Hypoallergenicity and efficacy of an amino acid-based formula in children with cows’ milk and multiple food hypersensitivities. J Pediatr 2001;138:688–93.
. Allergy to soy formula and to extensively hydrolyzed whey formula in infants with cows’ milk allergy: a prospective, randomized study with a follow-up to the age of 2 years. J Pediatr 2002;140:219–24.
. The patch test, skin prick test, and serum milk-specific IgE as diagnostic tools in cows’ milk allergy in infants. Allergy 1999;54:837–42.
. Determination of food specific IgE levels over time can predict the development of tolerance in cows’ milk and hen’s egg allergy. J Allergy Clin Immunol 2004;114:387–91.
. Clinical course and prognosis of cows’ milk allergy are dependent on milk-specific IgE status. J Allergy Clin Immunol 2005;116:869–75.
. Dietary products used in infants for treatment and prevention of food allergy. Arch Dis Child 1999;81:80–4. American Academy of Pediatrics Committee on Nutrition. Hypoallergenic infant formulas. Pediatrics 2000;106:346–9.
. Positionspapier. Das Vorgehen bei Säuglingen mit Verdacht auf Kuhmilchproteinallergie. Pädiatrische Allergologie 2005;4:14–18.
. Landelijke standaard voedselallergie bij zuigelingen [National standard for food allergy in infants]. 5th ed. Den Haag: Voedingscentrum, 2005: 80. Finnish Paediatric Society. Food allergy in children. Duodecim 2004;120:1524–38.
. Genetic and environmental risk factors for the development of food allergy. Curr Opin Allergy Clin Immunol 2005;5:249–53.
. Breastfeeding as prophylaxis against atopic disease: prospective follow-up study until 17 years old. Lancet 1995;346(8982):1065–9.
. Breast-feeding of allergic infants. J Pediatr 1999;134:27–32.
. Elimination diet in cows’ milk allergy: risk for impaired growth in young children. J Pediatr 1998;132:1004–9.
. Cow’s milk allergy is associated with recurrent otitis media during childhood. Acta Otolaryngol 1999;119:867–73.
. The role of allergy in recurrent otitis media with effusions. J Investig Allergol Clin Immunol 2004;14:514–18.
. Symptoms, diagnosis and management of colicky infants with regurgitations. Int Semin Paediatr Gastroenterol Nutr 2002;11:1–7.
. Cow’s milk proteins cause infantile colic in breast-fed infants: a double-blind crossover study. Pediatrics 1983;71:268–71.
. The natural history of food allergy. Pediatrics 2003;111(Suppl):1631–7.
. The role of breast-feeding in the development of allergies and asthma. J Allergy Clin Immunol 2005;115:1238–48.
. Bovine beta-lactoglobulin in human milk from atopic and non-atopic mothers. Relationship to maternal intake of homogenized and unhomogenized milk. Clin Exp Allergy 1990;20:383–7.
. Exposure of the fetus and infant to hens’ egg ovalbumin via the placenta and breast milk in relation to maternal intake of dietary egg. Clin Exp Allergy 2005;35:1318–26.
. German Infant Nutritional Intervention Study Group. Effect of exclusive breast-feeding and early solid food avoidance on the incidence of atopic dermatitis in high-risk infants at 1 year of age. Pediatr Allergy Immunol 2002;13:234–42.
. Food allergy in fully breast-fed infants. Clin Allergy 1980;10:133–6.
. The predictive value of specific immunoglobulin E levels in serum for the outcome of oral food challenges. Clin Exp Allergy 2005;35:268–73.
. Hypoallergenicity of an extensively hydrolyzed whey formula. Pediatr Allergy Immunol 2001;12:83–6.
. Intolerance to protein hydrolysate infant formulas: an underrecognized cause of gastrointestinal symptoms in infants. J Pediatr 1997;131:658–60.
. Comparison between skin prick tests with commercial extracts and fresh foods, specific IgE and food challenges. Allergy 1997;52:1031–5.
. “Atopy patch tests” in the diagnosis of delayed food hypersensitivity. Allerg Immunol 2002;34:95–7.
. Double-blind, placebo-controlled food challenge (DBPCFC) as an office procedure: a manual. J Allergy Clin Immunol 1988;82:986–97.
. Fatal allergy as a possible consequence of long-term elimination diet. Allergy 2004;59:668–9.
. Acute allergic reactions in children with AEDS after prolonged cows’ milk elimination diets. Allergy 2006;61:370–4.
. Cross-reactivity between milk proteins from different animal species. Clin Exp Allergy 1999;29:997–1004.
. Cross-reactivity between mammalian proteins. Ann Allergy Asthma Immunol 2002;89(Suppl 1):11–15.
. Allergenicity of alpha-caseins from cow, sheep, and goat. Allergy 1997;52:293–8.
. Soy protein infant formulae and follow-on formulae: a commentary by the ESPGHAN Committee on Nutrition. J Pediatr Gastroenterol Nutr 2006;42:352–61.
. Food protein-induced enterocolitis syndrome caused by solid food proteins. Pediatrics 2003;111:829–35. In the original figure, there were two arrows pointing from the box "open challenge with cow's milk formula under clinical observation" to the bow just below "no CMPA symptoms; resume CMP and monitor". The right arrow should point to the box to the right "CMPA symptoms" (there was no arrow pointing to this box in the orginal figure). Funding: The consensus panel, the literature search and the drafting of the manuscript were funded by a grant from SHS/Nutricia. The paper was drafted by Mark Greener, a medical writer. SHS International Ltd and Nutricia did not have any editorial control over the final manuscript, which remains entirely the responsibility of the authors. Competing interests: DH, CD, MB, SK and YV declare they have received support for clinical research projects from SHS/Nutricia and the same authors and MB declare they have presented lectures at SHS/Nutricia-sponsored meetings. Also, SK has presented lectures at sponsored meetings and received support for scientific work from Mead Johnson and Nestle. YV has received support from Janssen Pharmaceuticals, Astra, Wyeth, Biocodex and Nestle. None of the other authors made any declarations relevant to the preparation of this manuscript. The authors declare the absence of competing interests and confirm their independence regarding the content of this manuscript. Yvan Vandenplas and Sibylle Koletzko are joint lead authors. Archives of Disease in Childhood 2007; 93 93-93 Published Online First: 21 Dec 2007.